Will Donald Trump’s swaggering, self-aggrandizing response to the Orlando shooting help him in November? Does Terrorism Help Donald Trump? His swaggering, self-aggrandizing response to the Orlando shooting revealed the GOP candidate’s terrifying electoral strengths and clear political weaknesses. 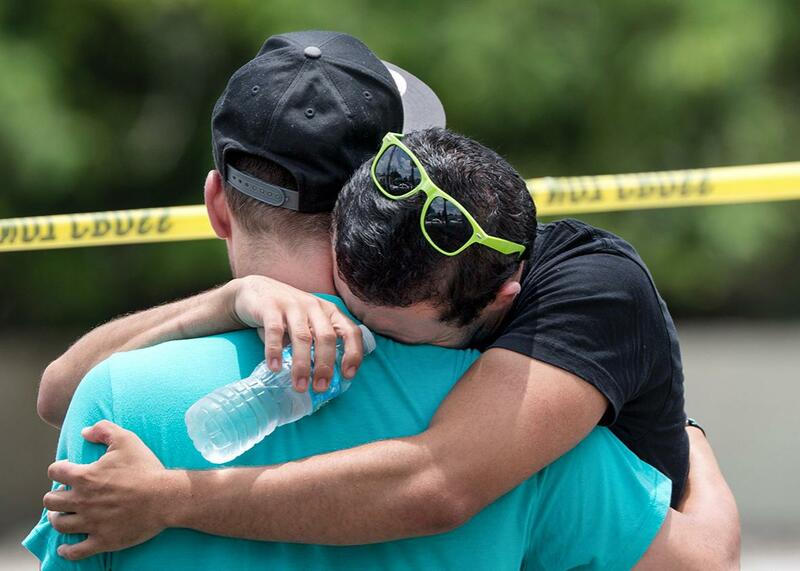 Supported by a friend, a man weeps for victims of the mass shooting just a block from Pulse nightclub in Orlando, Florida, on Sunday. On Sunday, as news trickled in from Orlando, Florida—where a man who pledged allegiance to ISIS murdered 49 people at a gay nightclub before he was killed in a standoff with police—our presumptive presidential nominees took to Twitter to make their initial statements. This was Hillary Clinton’s—a traditional response, forgoing the immediate politics for a simple statement of empathy. Then there was Donald Trump’s. He continued along this line, mixing concern with his message, with far more of the latter than the former. This was followed by a call for President Obama to leave office. In short order, Trump had taken a terrible tragedy—among the worst in American history—and made it an excuse to stunt for his fans. For those inclined to hate everything Trump stands for, this self-aggrandizing, insensitive preening was an awful look. But given his relentless focus on security and “strength,” could these attacks actually help his cause vis-à-vis a fearful electorate that wants safety? Intuition says yes: Trump promises a domineering swagger that he will deploy against all of America’s enemies, foreign and domestic. In a crisis like this one, many Americans might want that attitude—a primal posture against the world at large. Just look at the results from the Republican presidential primaries, where the attacks in Paris and San Bernardino were clear boosts to Trump, who called for a ban on Muslim entry to the United States, and parlayed the fear and anger of Republican voters into greater support. But as much as they support our intuition that terrorism boosts the appeal of candidates like Donald Trump, Merolla and Zechmeister also complicate it. Republicans are viewed as more confident in the context of terrorism, but the effect is greatest when they have “relevant national security experience.” Trump’s aggressive rhetoric stands in stark contrast to his thin résumé and the broad sense that he lacks the disposition to serve in the Oval Office. In a May survey from CBS News and the New York Times, for example, 70 percent of registered voters said Trump lacked the “right kind of temperament” to be president. Trump was able to overcome these sorts of doubts about his suitability for office in the Republican primary. But that was an unusual and dysfunctional environment, where Trump could succeed with minority support against a crowded field. It’s not clear how he will fare where there’s a binary choice and where the “temperament” question becomes much more important, especially when prominent Republicans have raised it in opposition to his White House bid. And while the Clinton of 2005 lost marks in the context of terrorism, the Clinton of 2015 gained them. By 50 percent to 42 percent, more Americans said they trusted the former secretary of state vs. Trump to handle the threat of terrorism, according to a Washington Post–ABC News poll conducted in the aftermath of the Paris attacks—at a time when Americans named terrorism the biggest problem in the United States. A second Post poll, conducted in March, found an even starker divide: A whopping 61 percent of Americans said they trusted Clinton to tackle an international crisis, compared to just 32 percent for Trump. And 54 percent said they had faith in Clinton to deal with terrorism, versus 40 percent for the real estate mogul. The same hawkish policies that drove Democratic opposition to her candidacy in the primary, may—in the post-Orlando world—help her win over a larger public that wants action against real and potential threats. As analysis goes, all of this is unsatisfying. There’s strong evidence on both sides of this question, and how you view things depends on your lens and aperture. The Orlando attacks may rejuvenate a flagging Trump effort or they might strengthen Clinton’s confident campaign. But Orlando does, at least, provide a stable ground for speculation. For as much as Trump is aided by the “R” next to his name, he’s also harmed by his affect and lack of experience. By provoking a backlash with his initial comments—thus emphasizing his worst qualities—it’s possible that Trump has handicapped his ability to turn a “natural” advantage into tangible support. On the same score, Clinton’s hawkishness and measured but aggressive response may mitigate any disadvantage based in gender and party ID. One final point. We should not ignore what a pro-Trump response means. The Republican nominee’s narcissism in the face of tragedy might be offensive but his demagoguery is dangerous. Trump wants to use today’s distress and panic to turn the heat up on millions of loyal, law-abiding Americans—treating them as threats, not allies. Will the voting public succumb to this fear or will it remember the plea of one of its most consequential representatives, who at a time of truly existential crisis, urged his fellow citizens to embrace the better angels of their nature? Read more from Slate on the Orlando shooting.